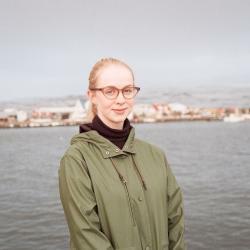 Bára Gísladóttir is a young Icelandic composer. Her album “Different Rooftops” was released earlier this year and she has been busy since. This summer she will be touring with New York’s TAK Ensemble, performing her own pieces, and with the Errata artist collective. She’ll also be travelling to Sweden for the Holland Opera Festival with Elektra Ensemble and Elísabet Einarsdóttir, performing pieces by Errata Collective as well. Now, she’s working on an orchestra piece for the Helsingborg Symphony Orchestra and the Danish National Symphony Orchestra, and if that weren’t enough, she’ll be performing at Iceland Airwaves, releasing a new album, and publishing a book of visual art and sheet music. We asked Bára to name five albums that have had an impact on her life. This album is one of my absolute favourites. The album features many of the best Icelandic choir compositions by one of my favourite composers, Þorkell Sigurbjörnsson. His compositions are performed by my old choir, Hamrahlíðarkórinn. I have listened to and performed these songs countless times and yet always want more. Definitely one of the best releases in the history of Icelandic music. I love every single detail of this super satisfying sound world. Their second album ‘Önnur Mósebók’ is in fact just as fantastic as the first one, but the feeling of the discovery of ‘Búum til börn’ simply cannot be replaced. In addition to this, Moses Hightower contains some of Iceland’s most prominent musicians, and consequently performs some of the most extraordinary gigs. Even though I stopped listening to this some while ago, I feel that I’m obliged to put ‘Ágætis byrjun’ on my Top 5, considering how obsessed I was with it for years. I got hooked on the album around the time I was first realising I would simply have to work within the field of music. Its pieces encouraged me in the most positive way in my early development as a musician/composer. I hated this album at first! It caused a lot of disappointment, because at the time my musical taste spanned approximately 3 cm2 and I disliked everything I found out of control. I had really gotten my hopes up for this album, since ’Mugimama Is this monkeymusic?’ was one of my favourite albums at the time. In some fucked-up stubbornness I couldn’t let the album just go, so I repeatedly listened to it every day, trying to find what annoyed me so much. Before I had any concrete answers, the album had become my all-time favourite obsession. This process helped me loosen up and probably has a lot to do with my urge to always go further and to push the boundaries in all my compositions and performances. Thanks Mugison! DON’T MAKE ME CHOOSE BETWEEN BJÖRK’S ALBUMS WRARRRRGHH! ANYWAY, IT’S PROBABLY ‘VOLTA’ AND I DON’T KNOW WHY! Check out Bára’s work on her website at www.baragisladottir.com.